Breast Cancer Bear. Wearing pink shirt; breast cancer ribbon. NIP AVON Breast Cancer Crusade Bear. We will do our best to answer them. Cute Cuddly Silky Fluffy Light Golden Brown PlushTeddy Bear, Chester with his Stuffed Armchair. Teddy holds a fabric bound red book, wears his plaid wool vest and eye glasses and sits in his stuffed teddy bear print fabric armchair. 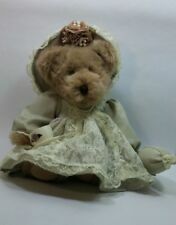 Vintage Praying Teddy Bear Avon 1999 with Bear Slippers needs batteries . Condition is Used. Shipped with USPS Priority Mail. This hat is for the Kerby safari bear. There is no bear or shirt, this is just for the hat only of the outfit. New Avon June Birthstone Full O' Beans 2000 Caterpillar Big & Little June Bug Plush. Simulated Birthstone (Alexandrite). The big bug is approx 8" Long and the little bug is approx 4" Long. Both embroidered with the year '2000'.
" BUTTERCUP ". HAT BOX TEDDIES. AVON CANADA. 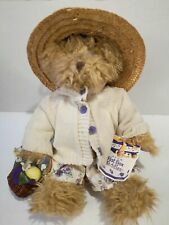 AN AVON HAT BOX TEDDY. THE COLLECTIBLE AVON HAT BOX. EXCLUSIVELY FOR AVON CANADA INC. SOFT STUFFED PLUSH BEAR. BEAR IS IN EXCELLENT CONDITION. This sweet toy, the long-loved 'Inspirational Singing Bear', is in pristine condition - a collectible plush white angel to be treasured, by AVON, 2001. Size 10" (approx.). 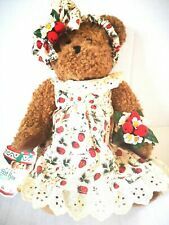 Avon Canada Hat Box Teddies STRAWBERRIE Strawberry Bear 13 in. STRAWBERRIE Bear. 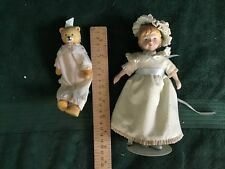 Avon Canada Hat Box Teddies. The Collectible Avon Hat Box Teddies series. She is wearing a beautiful cotton strawberry print dress. Strawberry corsage on her wrist with stuffed. and I am an Avon Hat Box Teddy. AVON Kids "Talk To Me Teddy" In box with Tag Voice Activated - Says 8 Phrases. In excellent condition still has the tag on. Tested and working will require 3 AA batteries not included. You can ask it a question and it will respond. Please see all photos for better description. Feel free to ask any questions and thank you for looking. Avon Gift Collection I Love My Sister 1996 Very Special Bears Stuffed, plush bear in original, unopened plastic bag. Measures approx 8-1/2 inches. New in original box, never used. ~ Beariff the Sheriff (1986). ~ Beariff the Sheriff has crack in hat. ~ Jointed, 12" (approx). ~ Huggie Bear (1985). Fine Print . Avon Full O' Beans Birthstone June caterpillar and baby that are in great condition. When tummy is squeezed the bear says "I Love You This Much" and his arms open. Dated 1989. Brown bear wearing a blue shirt w/logo. 1980s Avon Chinese PANDA World of Wonderful Bears Plush 12"
It is wearing a hat that says World Of Wonderful Bears on it. It is in good played with condition with normal wear from play. T his item is in great usedCondition. He is in excellent condition. Adorable AVON Collectable. Big and cute! No Reserve. Simulated Birthstone (Diamond). The big duck is approx 6" Tall and the little hippo is approx 3.5" Tall. Both embroidered with the year '2000'. This item is sealed in the plastic bag. Simulated Birthstone (Garnet). The big bear is approx 8" Tall and the little bear is approx 4" Tall. Both embroidered with the year '2000'. Simulated Birthstone (Sapphire). The big pig is approx 7" Long and the little hippo is approx 3.5" Long. Both embroidered with the year '2000'. This item is sealed in the plastic bag. This is a beautiful brown stuffed bear from Avon. This bear is wearing a very pretty outfit reminiscent of the Victorian era. She is in excellent pre-owned condition, no stains or holes. This bear would make a very nice addition to your bear collection. Up for your consideration is a new Avon 2015 plush bear with a red holiday sweater. Black marker writing on the plastic bag. Avon Healthy Remedies Lavender Scented Bear Plush Stuffed Animal in Robe 12"
Factory Sealed. I do believe the year for this item is 1993. Great collector item. Little bear holding a fish. MR. & MRS. CLAUS. SINGING AND TURNING FROM SIDE TO SIDE. WITH ORIGINAL BOX FROM AVON. CAN SING AND TURN OR JUST TURN OPTION. IN EXCELLENT PREOWNED CONDITION - LIKE NEW. New Avon Birthstone Full O' Beans 2000 Big & Little August Purrdy the Lion Plush. Simulated Birthstone (Peridot). The big lion is approx 8" Tall and the little lion is approx 4" Tall. Both embroidered with the year '2000'. Vintage 1986 Avon Somersaults Pals Plush - Tallulah 8"
AVON HAT BOX TEDDY F526081 BEAR & BOX - NEVER DISPLAYED - ONLY ONES!